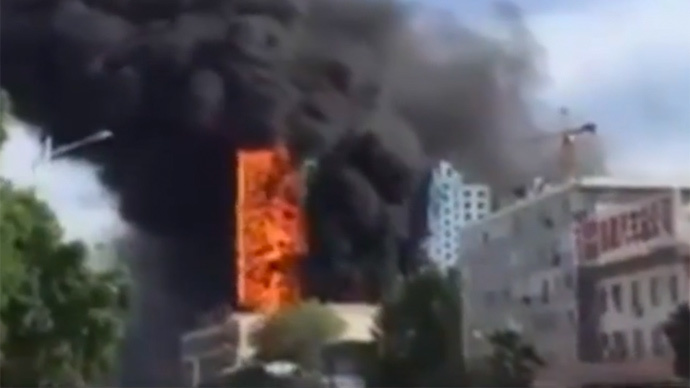 A high-rise in an unnamed Chinese city has erupted in flames midday, a terrifying video has revealed. It captured the blaze overwhelming the entire building in a matter of seconds. Black smoke can be seen billowing out of the building before it is entirely eaten up by the flames, while stunned passers-by can be heard discussing the fire just out of shot. The only thing clear about the location is that it is not a rural one, and is being presumed online to be somewhere downtown. The person filming has likewise not been identified. It is not known if any casualties ensued.